This story has been corrected. An original version attributed additional comments to Jackson, including comments about gay people, that were not the subject of his quote below and in the video. E.W. 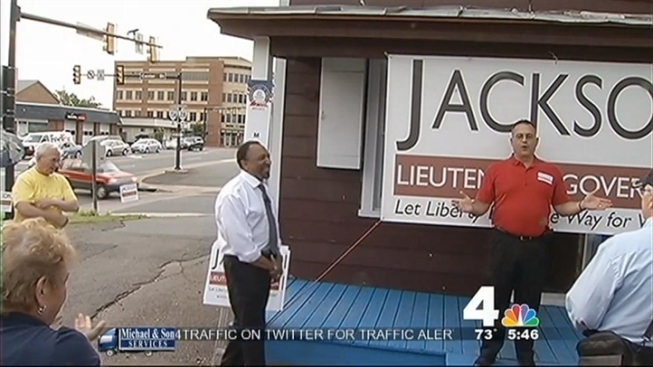 Jackson, the Republican nominee for lieutenant governor, was in Manassas Wednesday and spoke candidly with News4. Jackson, a Chesapeake-based minister, is known for his controversial remarks including saying that Planned Parenthood was worse for African-Americans than the KKK. Wednesday, he spoke at Republican headquarters in Manassas and stood behind those controversial statements. "I wouldn't have said it if it didn't represent my values," Jackson said. "I wasn't the one at the Democratic convention who said, 'Take God out of the platform.' That was something that they did." Jackson said the biggest misconception about him is that he is -- in his words -- only a minister. He is also working to convince people in northern Virginia that he understands their concerns, especially when it comes to transportation issues.